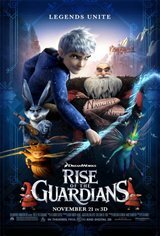 When an evil spirit known as Pitch the Bogeyman (Jude Law) tries to take over the world by inspiring fear in the hearts of children, the immortal Guardians, aka heroes from different childhood storiesJack Frost (Chris Pine), Easter Bunny (Hugh Jackman), Tooth Fairy (Isla Fisher), Sandman and Santa Claus (Alec Baldwin)must join forces for the first time to protect the hopes, beliefs and imagination of children all over the world. The film is based on William Joyce's book The Guardians of Childhood however, there are some differences between the book and the movie. The book explores the origins of the characters while the film shows how these characters function in present time. One of the reasons for making them different was so that audiences wouldn't compare the book to the movie. So, according to the author, the book served as more of an inspiration for the world in the movie as opposed to being the basis of its plot.